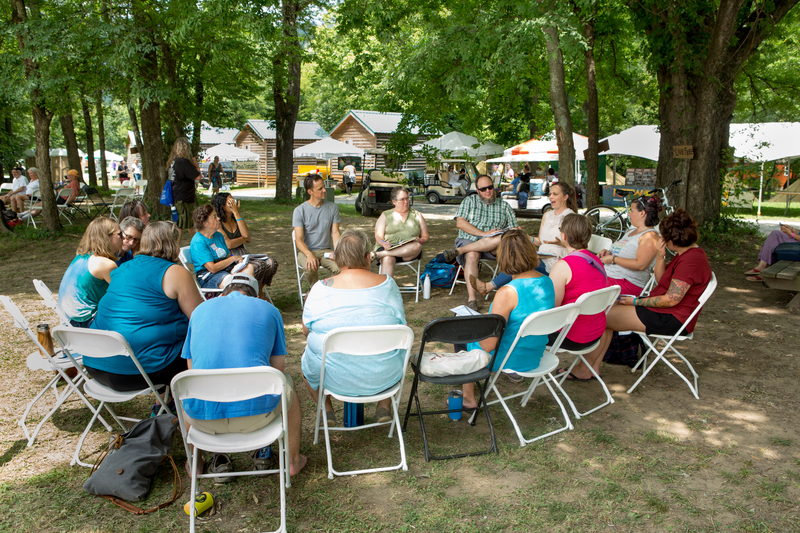 Convo Hall – an exciting new Wild Goose Festival concept! It’s designed to promote intimate programming spaces where people gather around a topic. We’ve been exploring ways to make the Goose more personal, more conversational, and more interactive. Convo Hall is big move in that direction. It’s our hope that this “experimental” concept will enlarge the co-creator community AND will turn the communication path on its side – facilitating richer insight and deeper connection – community. We believe it may also form the basis for us to extend the Wild Goose experience to other locations. 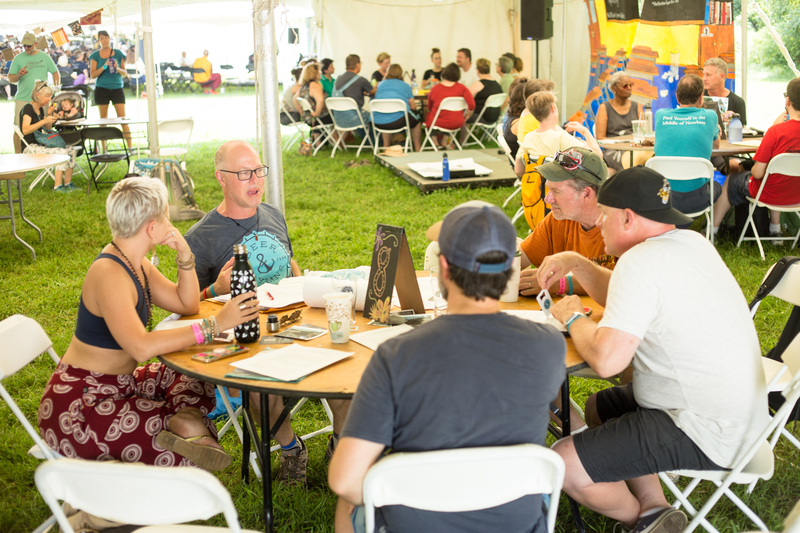 We’ve converted one of the large tents on the “plateau” from a “one-presentation-at-a-time” venue to a conversation hall where a number of small group conversations take place simultaneously. This eliminates 18 regular time slots but adds up to 96 slots of a modestly different nature. In 2018 when we debuted this concept, Convo Hall was set with nine, five-foot round tables. Each convo is limited to ten people (including facilitator), is 50 minutes in length, and may be scheduled in two separate time slots (so everyone gets two opportunities to present, if they want). Repeating allows larger impact and makes it possible for word of mouth to create a buzz about the upcoming repeat presentations. 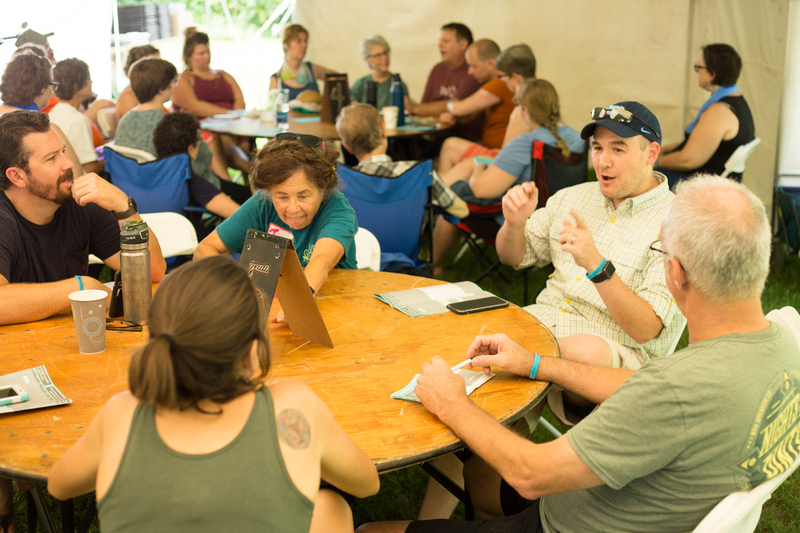 We’re excited about how this can bring people together in small groups with genuine interaction and conversation around specific topics – and how it serves as a way to get to know others in the community.